This year, Spring officially began on March 20. With all the warm weather we’ve had lately, many of us can’t wait for higher temps that are here to stay. To celebrate sunny skies to come, we’ve rounded up a list of our favorite seasonal fruits and vegetables to inspire your Spring cooking adventures. Be sure to check out the Spring-inspired recipes from the kitchen of our very own chef extraordinaire Jen Lamplough. For more healthy recipe inspiration from Chef Jen, visit our cooking resources page where we’ve posted a variety of recipes by category — appetizers, salads, sides, desserts and more! Did you know that bright orange apricots are related to dark purple plums? People have been growing apricots around the world since prehistoric times. Health benefits: There are many reasons to stock up on apricots this Spring. They boost your digestive system, increase your energy by maintaining electrolyte balance in your body, and help fight off fevers, earaches and anemia. Apricots are also great for skincare, and helping to soothe various skin diseases and conditions like eczema thanks to their powerful antioxidant compounds. A brief warning about apricots: they have been known to cause allergies, and dried apricots can induce asthma attacks due to their sulfite levels. However, apricot oil is a known asthma relief aid, having essential oil properties. How to buy: Since apricots are tree-ripened and do not ripen further after picking, choose uniformly colored apricots that are slightly soft to the touch. To store, keep apricots in an untied plastic bag for 3-5 days. To soften a slightly under-ripe fruit, store in a paper bag at room temperature. Mangoes are related to the pistachio family and originated in Southern Asia. They are commonly nicknamed “the king of fruits” for their powerhouse lineup of health benefits for your whole body, as well as helping to protect against the effects of aging. Health benefits: High in potassium and magnesium, mangoes are a great choice for people with high blood pressure. They are also great for lowering cholesterol thanks to their pectin content—a soluble dietary fiber. Mangoes can help keep your immune system strong and maintain brain health with major boosts of beta-carotene and vitamin B6 – What’s not to love? How to buy: Mangoes come in red, yellow, and green varieties, hailing primarily from India, Thailand, Malaysia, and the Philippines. With green varieties, look for a sweet aroma since they do not turn red or yellow. Ripe mangoes can be stored in the refrigerator for up to 2 weeks, while unripe mangoes can be stored in paper bag at room temperature on the counter for a couple days up to a week. For a quick, easy, and delicious appetizer or dip for your next get together, try this black bean mango salsa recipe from Chef Jen’s kitchen – it’s sure to be a hit! 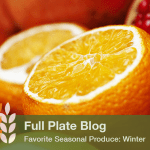 Aside from apricots and mangoes, some of the most popular fruits such as strawberries, pineapple, and blueberries all come into season starting in the Spring. Be sure to look out for better prices at the grocery store in coming weeks! Broccoli is a versatile veggie perfect for a variety of recipes that also packs an impressive amount of health benefits. In fact, just a single serving offers more than the daily value of vitamin C and more than 10% of your daily Vitamin A. Eat up! Health benefits: From fighting heart disease, promoting eye health, detoxifying your body of harmful chemicals, and promoting healthy pregnancies for women, broccoli is a tried and true favorite that shouldn’t be overlooked. It deserves a place on your plate (and your body will thank you)! Read more about the extensive benefits of broccoli here. How to buy: Choose bright green heads of broccoli with tightly clustered florets and firm stalks. The more open the florets, the closer to flowering they are. Keep broccoli dry and open in the refrigerator so it can breathe until you’re ready to prepare it. It will keep for up to a week. Here is a fun recipe to spice up how you use broccoli in the kitchen from Chef Jen. 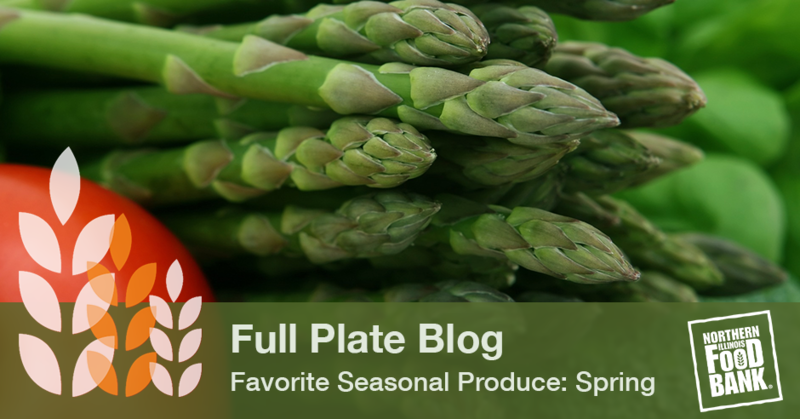 Best enjoyed during its brief peak season, asparagus can be enjoyed both raw in salads or cooked in heartier recipes. Though it may not be as much of a staple on your dinner plate as broccoli or its other leafy green relatives, don’t let the lean appearance of asparagus fool you – it too is a nutritional powerhouse not to be ignored! Health benefits: Asparagus is loaded with nutrients and antioxidants, like many other springtime veggies. Like its leafy green cousin broccoli, asparagus boosts brain health and helps prevent age-related cognitive decline thanks to its folate and B12 content. Asparagus is also one of the top cancer-fighting and age-defying veggies around, with a powerful mix of antioxidants and other detoxifying compounds that fight cancer by breaking down free radicals and other carcinogens. Its high folate content can even ward of depression. How to buy: While green asparagus is the most common variety found in the grocery store, there are also white and purple varieties. White is more delicate, while purple has a fruitier flavor. Thinner stalks are typically tender and sweet, while thicker stalks are heartier and have a stronger asparagus flavor. Store your asparagus by wrapping the ends in damp paper towel. Always plan to use your asparagus within two days of purchasing it, as it has an extremely high respiration rate (meaning it much more perishable than other vegetables). And a quick tip for sautéing your asparagus spears – thinner spears only need 3 minutes, and thicker spears need 5 minutes. Other waterless prep techniques like roasting, grilling, and stir-frying also preserve the antioxidant power of asparagus. Donate to help us solve hunger in your community – every $1 donated provides $8 worth of food. (1) “10 Proven Benefits of Apricots.” Organic Facts. N.p., 14 Feb. 2017. Web. 23 Mar. 2017. (2) Walsh, Danielle. “How to Buy, Store, and Cook Fresh Apricots, In Season in May.” Bon Appetit. Bon Appétit, 08 May 2013. (3) “11 Surprising Benefits of Mangoes.” Organic Facts. N.p., 20 Feb. 2017. Web. 23 Mar. 2017. (4) “11 Top Benefits of Broccoli.” Organic Facts. N.p., 06 Mar. 2017. Web. 23 Mar. 2017. (5) Fuller, Janet Rausa. “Eat Your Broccoli.” Epicurious. N.p., 24 June 2015. Web. 23 Mar. 2017. (6) “5 Powerful Health Benefits of Asparagus You Probably Didn’t Know.” EatingWell. N.p., n.d. Web. 23 Mar. 2017. (7) “Spring Treat: How to Buy, Clean, and Prepare Asparagus.” Kitchn. N.p., 24 Mar. 2010. Web. 23 Mar. 2017. (8) “Asparagus.” Asparagus. N.p., n.d. Web. 23 Mar. 2017.